So why the New Course? Well it’s winter in Scotland if you want to arrange a decent game of golf in advance without waterlogged fairways and risk of winter greens then it has to be played on links. 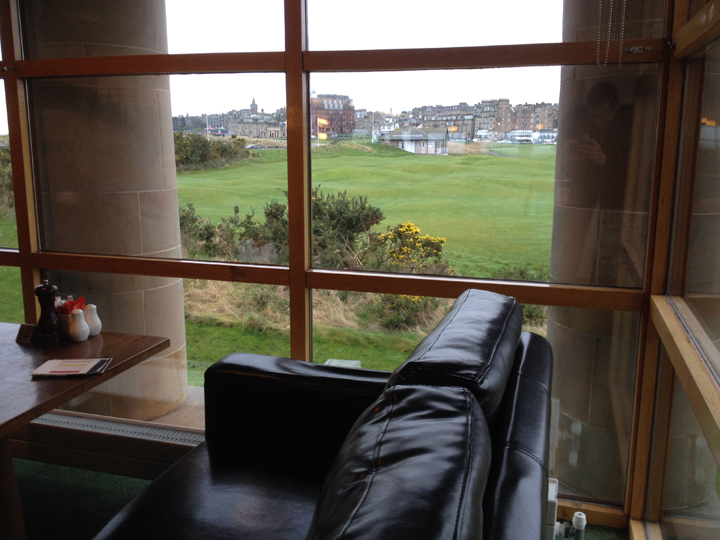 So we saw that we could play the New Course at St Andrews for a very reasonable £37 ($55) and thought ‘why not’. Okay it would be off fairway mats but then again that’s only if I manage to hit the fairway. Being from the west coast and playing much of my links golf at Troon, I have never played golf at St Andrews, I guess most Scots haven’t. And although I would have loved to play the Old just playing one of the other courses (seven in total) would still put a major tick in my golfing career. I have visited St Andrews many times for many other reasons, and attended two Opens there, so I know the town pretty well but apart from it’s other attractions it is the Holy Grail of golf, the quintessential golfing town. The weather forecast for the day was to be dry, on the drive in I was getting worried about the mist/fog, but it was clear when we reached the links. I was tempted to drive across Granny Clark’s Wynd (a one-way public highway across the 1st and 18th fairways, and an integral part of the course) but thought my car didn’t need an errant golf ball through the window so drove around the famous R&A clubhouse. Just the drive around the 1st and 18th is… odd. It must be the most familiar place in the world, the thousands of photographs taken of it, the miles of film reel. The bunkers have names. The bumps in the fairways have names. I glanced over to the Valley of Sin in front of the 18th green and could picture Seve doing that dance. It’s like meeting a film star made of grass. Onward to the clubhouse of the St Andrews Links Trust, it is they and not the R&A who are the true keepers of the golf courses in St Andrews. I remembered when attending the 2010 Open I watched Miguel Angel Jimenez park his car and while chomping on an obligatory cigar got his clubs out the boot, signed autographs then walked off to the makeshift driving range. I made an effort to park my car in the same space. The clubhouse looks fairly new (less than 20 years old which in comparison to any other Scottish clubhouse is modern indeed.) It’s also unlike any other clubhouse I’ve visited, very efficient, modern yet traditional. It’s this town’s business to process golfers and very good they are at it too. I almost have the feeling that the clubhouse is designed to fit a stereotype of what an American thinks a Scottish clubhouse should look like. Tartan carpet, oak lockers, yet not a stuffy country club. There’s showers free to use (with towels). With our 11.28 tee time fast approaching we found the starters hut (a window in the main building) where the starter gave us some advice, issued us with our fairway mats and with possibly the nicest scorecard, pencil and yardage book I’d ever seen. 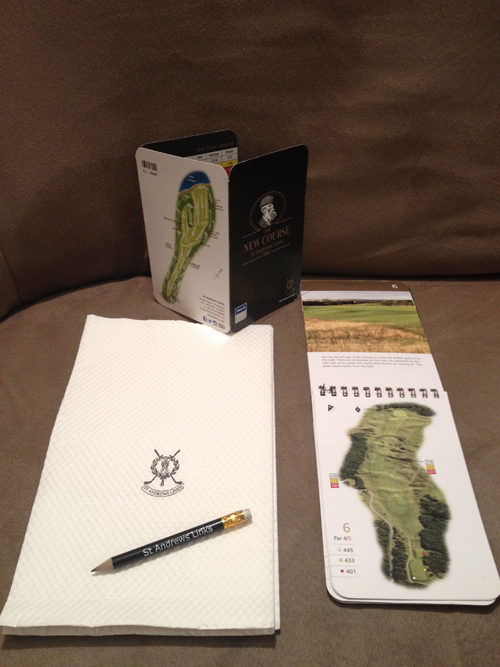 I was expecting the yardage book to be a hefty price as a keepsake but it’s all included in the package. I’d read up on the New Course before my arrival. Built in 1895 by Old Tom himself it’s older than most golf courses in the world. Some proclaim it to be a worthy golf course in it’s own right but unfortunately overshadowed by its overbearing big sister. Others found it totally ordinary, the only reason it’s played is due to its location. I was curious what I’d find it to be. Standing on the 1st tee I’m a scant fairway’s width away from the Old Course Hotel (the 2nd and 17th fairways of the Old Course are shared at this bottleneck.) The New Course runs parallel and is offset by a hole from the Old Course that starts right in the middle of town. The 1st is adjacent to 2/17 and so on. I looked down the fairway only I couldn’t see the golf course. At The Open on the Old I sit in the grandstands as the course is actually a very poor viewing course for spectators as it seems flat and featureless until you are actually in the middle of it. I looked at the Strokesaver, there’s the bunker the green just beyond but there’s no definition between fairway and rough it’s all flat and sameish. I carve my drive just shy of the 18th fairway, wedge to the green and make my par. Happy with that start. The next couple of holes continue on that theme, the hole are nothing spectacular, flat featureless, subtle. I begin to wonder if the negative reviews were correct. It’s in good condition, fairways dry and greens quick for November but not blown away by it so far. Then on the 4th, in the middle of the fairway there is mounding the likes of which wouldn’t be found on anything other than a links course. It’s not there by design, because an architect and bulldozers put it there. It just happened to be there when the grass was cut short and green placed 30 yards beyond. If your ball hit if who knows what kind of bounce you’d get. Links golf. Then the 5th, a nice par 3, deep pot bunkers guarding the front, a green with a crazy hollow in the middle. This course is getting interesting. Then onto the 6th. Again a jealous look over to the 9th/10th holes of the Old which loop around at this part. But I look at the fairway in front of me and it’s more interesting. Suddenly I appreciate the New Course and it doesn’t feel like the younger sibling. It’s the tomboy from a 1980s teen movie who suddenly becomes attractive at the end and the hero realises he’d been looking for love in the wrong place all this time. Holes 5-10 are certainly among the best golf holes I’ve ever played. The 10th runs alongside the fine looking Jubilee course, which is now on my list of want to play courses, but again I felt no jealousy as the 460 yard 10th is one of the greatest par 4s in the world – my opinion but also that of Golf Magazine. One thing I did have trouble with was the links style chip and run. I have grown playing the public links at Troon, it is a shot I’m very familiar with. However I couldn’t bring myself to hit it, although it was a dry day it had been a wet November and I couldn’t quite believe the ball would run as far as it did so I reverted to my 56 degree wedge more often than I should have. Kieran used a hickory mashie-niblick to great effect, I shall be using my 8-iron more often next time. Ha! Already thinking about next time. The New Course is a bogey course. You could quite happily bogey it to death all the way round. But it’s more difficult to par it, you need to play every shot well to make par, as it should be. I remember getting quite frustrated going round, we were in effect playing the course defenseless as conditions were perfect for November, no wind and the rough died back. Yet all I could do was bogey hole after hole. Even still, +7 for the back 9 is a good day on the links for me. Back in the clubhouse for a surprisingly reasonably priced cup of tea and Diet Coke, we had the best view in the world. The panorama covered the entire 1st/18th of the Old course all the way over to the Road Hole Bunker and railway sheds of the 17th tee. We sat and watched the games trying to complete their round before the darkness fell and speculated about how many balls struck the Rusacks Hotel each year. It’s such an extraordinary place. On our way out we had a browse about the ‘pro shop’, essentially a glorified gift shop bearing the Tom Morris moniker. Nothing took my fancy then there was an amusing moment when Kieran exclaims how awful the Open 2015 logo is and how overpriced the merchandise is with one of the staff standing directly behind him. Still not sure if it was deliberate but I struggled to maintain a straight face. I’m now glad I played the New Course first. It’s allowed me to get the star-struck feelings out my system. If I just pitched up and played the Old Course it would be too much to take in. And it is too much, I found my concentration begin to wane on the 17 & 18th holes as the town and clubhouse became larger behind the greens. For next time I visit, to play the Old, I’ll be able to concentrate on playing the course and everything else will be 2nd nature. Probably. When Tweeters Play Golf: Hot Chocolate, Fairway Mats & Llamas.